For many people, food intolerance is a huge interruption to everyday life. Product availability has improved with gluten-free, wheat-free, dairy-free, refined sugar-free, or egg-free items now being available in many mainstream grocery stores. Larger cities also have the luxury of vegetarian, vegan or raw food café’s such as Megan May’s award-winning Unbakery Café’s. With the release of her first cookbook The Unbakery, raw food became more accessible to people living outside of the main centres or without access to café’s catering to specialist eating programs. 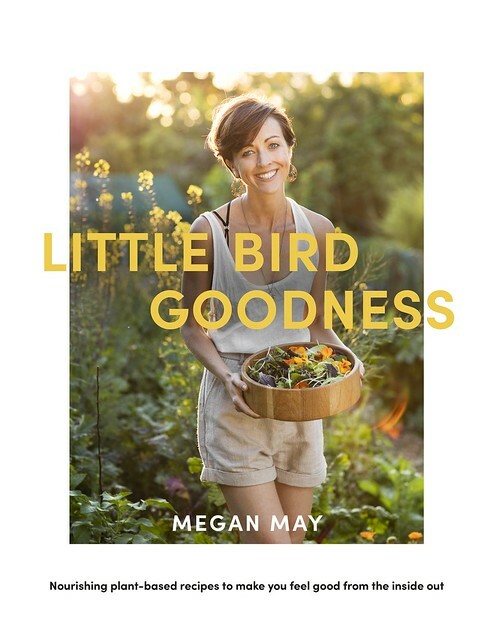 Little Bird Goodness, Megan’s second cookbook, is aimed at a larger group of people, not just those already eating raw food. These recipes are all plant-based but some include a cooked portion to help newbies ease into this type of eating. Thankfully, only one of our family members suffers from a food allergy/intolerance, but the vitality and enthusiasm of Megan for eating a plant-based diet encourages me to try to incorporate more raw components into our diet. Simple ideas such as Watermelon dipped in citrus spice mix, chocolate-dipped dried fruit or green superfoods popcorn all look delicious, fresh and healthy snack choices. The spiced pumpkin salad with caramelised shallot dressing would also fit into our diet without too much trouble ie ordering in a raft of new exciting ingredients. At the back of the book, the Basics section covers sprouting, (sprouts are fundamental to a raw food diet), as well as fermented foods such as kefir, yoghurt, kimchi and sauerkraut all of which are easy and very satisfying to make. Each recipe includes an equipment needed list which is useful to know before beginning a recipe, particularly as some equipment specified is not what an everyday regular kitchen would have, such as a cold brew coffee maker or a cold-press juice extractor. First up on my list of recipes to try is the Pea Guacamole and the popcorn. Megan also shares recipes on her website and for Bite Magazine (such as this delicious-looking intriguing-sounding Winter Spice Buttercup Cake with Coconut Cream Frosting. This entry was posted in Book Review and tagged book review, Little Bird Organics, Megan May, Penguin Random House New Zealand by Jo Dohrman. Bookmark the permalink.